Showing results for tags 'gfsquad'. I made this thread solely just to say, HOLY F*CK ON A CRACKER. I just had a newfound respect for subbers and translators. So recently I tried subbing and editing a 3 minute GFriend clip, and it took waaaaay much longer than I expected it would. Can't believe the amount of time and effort you guys pour into it. Kudos, good job, and keep up the good work, Buddies! It’s been 3 years that we are together with GFriend. To commemorate the most important and meaningful day, GFSquad.com is back to gave a beautiful presentation to everyone. First, let’s watch the 3rd Anniversary video. We hope Buddies will like it! 3 years of hard work, friendship and amazing journey. This video represents the very memorable scenes of moments being together with Buddies. As continuation from the 2nd Anniversary, which almost best and beautiful scenes are summarized, now this is a new chapter which focused on their beautiful relationship. This is a review that will show the details of each stories. The Action Intro: GFRIEND BEST STAGES The Intro represents like a movie trailer. An action trailer where all of GFriend’s best stages are included and compiled. Those scenes were the most amazing and beautiful. These stages came from different shows such as major awards in Korea, Concert festivals and Showcases. Beautiful stages that made Buddies even more proud when watching their amazing and mind blowing performance. We definitely loved it! The Beautiful Eras : Season Of GFRIEND The beautiful eras represents each seasons of GFriend. 6 seasons of music videos including Glass Bead, Me Gustas Tu, Rough, Navillera, Fingertip, Love Whisper and Summer Rain. Each part contains the most beautiful scenes where it shows strong bond of friendship and being together for a long time. Since these scenes summarizes all moments in the field of working as an artists. It is a representation of a story and concepts within just the music videos. The Youthful Climax : The Real Colors Of GFRIEND The climax part represents the real themselves. Revealing their personalities, relationship, bond and friendship. It is more focused in behind the scenes. Showing their youthful moments not just as group, but also as a family. Every people who will watch it, will definitely more in loved with GFRIEND Another fact. Yuju recommended a song for the members to listen is Troye Sivan's, 'Youth' song that was discussed during radio broadcast. The song and Its lyrics is definitely great and related to them. You can read the lyrics of 'Youth' by Troye Sivan here They are like young kids who likes to play always. They are full of innocence and very energetic. Trying new things. Experiencing extreme adventures. They are brave enough to show they are strong kids. On the last part, a transition of last stage from their first ever concert into predebut days.. It’s time to reminisce everything back from the start. Special memories are captured like the format of VHS tape. Let’s Reminisce: Memorable Pre-debut days Rain In The Spring Time as the background song (piano cover version). To give emotional feels that will touch everyone heart, It’s the sequences from their past days. Training, Pre-debut even the most memorable days such as anniversaries, celebrations into the present day. The Ending: Our Successful Journey The climax chorus part represents the glory days of their journey. As the part of the song says “Will you be with me forever?” together with the voice announcing them as the ‘Best Girl Group’ (GFriend’s award during 2018 Golden Disk Award), it indicates their success being together as a group with Buddies. In 3 years, many challenges came through. Their journey has been very successful. As a fan who will always stay for them, let’s be together and keep supporting them in our way we can. Let’s keep our relationship with GFRIEND forever, Buddy. Hi Buddies! We did it! GFSquad.com has made 1 year today! *CHEERS * It all started last year April with a goal of building a community for GFRIEND, and for a friendly place where Buddies can gather together as one. After a few months of much planning and preparations, we launched in July 2, 2016. It's truly been a fantastic and awesome year! Here's a list of some of the cool things we've participated in so far... GFRIEND Emoticon Making Contest 2016 GFRIEND Debut 2nd Anniversary Coal Wreath Project 2016 GFRIEND Debut 2nd Anniversary Video (by @Buddies_art and @Ria) DCINSIDE GFRIEND GALLERY x GFSquad - GFRIEND Debut 2nd Anniversary Project GFSquad Special Project: GFRIEND 2nd Debut Anniverary CD + 1st Signed Album Under GFSquad.com's Name GFSquad Mwave Meet and Greet Group Order GFRIEND 1st Fan Meeting "Dear Buddy" Rice Wreath Project Eunha & SinB 2017 Birthday Support Project Ye-Sister Birthday Project 2017 (has just started!) Thank you to all of our Donors, for your generosity made many of these projects possible. A special shoutout to @YujuHeroes, @Elliote(소원의정다움²), @skysky0520, and DCINSIDE GFRIEND GALLERY, and ㄱㅅㅎ for their help and support! Lastly, thank you Buddies, for without you there is no GFS Community! On behalf of the staff, I'd like to sincerely thank all of you who have supported our community and projects. We will continue to work hard for GFRIEND and Buddies all over the world! Together let's make happy memories! Events have ended. Thank you for playing! Congrats to the winners! In celebration of our 1st Anniversary, we'll hold events", with chances to win prizes! *Check back as we add more details and possibly more events! Event #1: Custom Titles: To start off, members with 100 non-spam posts (or more) may request a custom title here! Offers good until 7/31/2017! Event #2: Chat Triggers: In the chat I've placed hidden triggers (not the regular chat triggers), and if you are the 1st person to find one of these triggers, you'll win a regular The Awakening CD! Yes, it's that simple! Triggers can be a word, a phrase, a number, etc. Finding the correct trigger may be challenging of course. Where's the fun if it's too easy, haha! Only 1 person can win per hidden trigger! Only 1 win per person. Special Hidden Triggers: I should mention that there are special hidden triggers (in addition to the hidden triggers), and if you're the 1st person to find one of them you'll win 1 regular signed by all members CD (of your choice: The Awakening, LOL, Snowflake, Flower Bud, or Glass Bead). As of now there are at least 2 special hidden triggers. Qualify: As long as you can chat, you qualify. *3 non-spam posts to enter chat Time Zones: Not to worry. Members from different time zones will have a chance to win. How do you know if you found a hidden trigger? The trigger will say "GFS 1st Anniversary!.. *, and that you won (a CD). These hidden triggers will also have a different color than regular triggers. How do you know if you won a signed CD? The trigger will clearly say that you've won a signed CD. If the trigger does not say that, then you win a regular The Awakening CD. How to claim your prize: Take a screenshot of the trigger that you found and post it in this thread. The member who finds the trigger first will win, regardless of who post the screenshot first. We can verify the chat logs to see who found the hidden trigger first. What if you cannot accept the delivery of CD? If for any reason you cannot accept the CD, we'll try to work something out. Hint: The hidden triggers will have something to do with GFRIEND, Buddies, or the GFS Community. Hint #2: The word, phrase, number, etc., must match correctly. Hint #3: One of the triggers was "GFSquad.com 1st Anniversary". A few members were very close, but left out the ".com" or typed "GFS" instead. Try not to over-think things. These hidden triggers are easier to find with a clear mind...And sometimes staring you right in the face. Hint #4: All of these hidden triggers have reference, and can be traced back to something specific. Hint #5: GFS, GFSquad, GFSquad.com, or anything close to it, and anything "Anniversary" are no longer hidden triggers. Hint #6: If you're posting something long save your energy. Unless I've forgotten basic math (which is possible), these hidden triggers will not be more than 5 words max. Hint #7 (Mega Hint): Fingertip + Weekly Idol. Hint #8: The combination of Fingertip + Weekly Idol is no longer in play. Good luck to all! Winners (congratulations! ): @Yujunie won 1 regular The Awakening CD (for triggering "World Peace") @Corgi Eunha won 1 regular The Awakening CD (for triggering "SFSguad.com") @Fahmi won 1 regular The Awakening CD (for triggering "GFSquadproject") @YuaremySin won 1 regular The Awakening CD (for triggering "Interval Training") @YOJUyodiyuju won 1 regular The Awakening CD (for triggering "Just Dance") @Thanatos_D won 1 regular The Awakening CD (for triggering "Hey girl, ding-dong") Event #3: The Key to Success! : Eligibility: Logged in Members Only What about staff: Nope. The prize: (1) GFRIEND Where Are You Going?! (2 DVD) (Photobook + Postcards) (Limited Edition)! How to play: Enter this thread!!! Ah, but there is one problem. The thread is password protected. Your task is to find the password and enter the thread. Once you enter the thread, make a post (as proof), and take a screenshot of the winning message. Post the screenshot in this thread to seal the deal! Only 1 winner: There can be only 1 winner so the first to fulfill these tasks will be the winner. The Hint: How well do you know our Site Rules and GFSquad Staff? Find the link between these 2 sections and you'll find the key that unlocks the thread. The Advice: If you're using the GFS app you're at a huge disadvantage, since you won't be able to see these sections of the site. It's recommended that you view the site using the browser. (in either the regular or mobile themes). Good luck! Hwaiting! Winners (congratulations! ): @adha . @Edregol Yuju *Due to an error on my end, I'm awarding 2 winners instead of 1. *If for any reason you cannot accept the prize, we'll try to work something out. Event #4: The Game of Chance: Eligibility: Members Only What about staff: Nope. How this game works: It's very simple. If this happens, 1 lucky Buddy will win the prize. What is supposed to happen: Shhh...It's a mystery. How do you know if you win: A message will appear! How to claim the prize: If you see the winning message, immediately take a screenshot and post it in this thread. Only 1 person can win so HURRY!!! The Prize: 1 Official GFRIEND Glass Marble Lightstick! *If for any reason you cannot accept the prize, we'll try to work something out. Winner (congratulations! ): @mnalrp Questions about the Events, please ask! GFSquad.com are very glad to International Buddies who participated in this special event. We are also thankful to Buddies who tried their best effort to contribute and share their creativity to everyone! As we held an event for GFriend's 3rd Anniversary this coming January 16, 2018, we want every Buddy to participate in choosing the best Fan art that will display in GFSquad's congratulatory coal wreath. The instructions are easy, To vote for the best fan art, you can vote through GFSquad account and Twitter. (The voting has been changed to the following.) GFSquad Account Vote - 60% GFSquad Staff Vote - 20% Twitter - 20% Voting Deadline: January 11th, 2018 @ 11:59 PM KST So let's take a look in each masterpiece of talented Buddies! Good luck Buddies! AznSeoul posted a topic in Let's Talk GFRIEND! Hello Buddies, I thought that I would make a thread for those that are attending GFRIEND's 1st Concert ~ Season of GFRIEND. I heard of a few Buddies that were planning on attending (including some admins) and I know that many of us are probably going alone. It would be nice if we could all meet up in Korea go to the concert together and maybe even hit up a few GFriend MV filming spots or even just meet up in a cafe or something. So if you are going to Season's of GFRIEND don't be shy to let us know in this thread and we can touch base from there! Let me get things started! -- If ya'll don't know me. 안녕하세요 my name is Jon and i'm a long time Buddy from Toronto, Canada! I'll be going to both concert dates. I hope to see many of you there and get to know you better! How Do You Pronounce "GFSquad"? I've seen various ways of pronouncing "GFSquad", and so I am curious, how do you say it? Me: "G-F-Squad"
A new forum theme has been updated for GFSquad! This time, It's now Summer Rain theme! New header and color theme: A combination of Summer and Rain version of colors. Feeling of Rain vibe using different types of Blue pastel/soft colors and Some different types of Yellow pastel/soft colors for Summer vibe. Check the new Summer Rain colors on GFRIEND Forum section! Header for GFRIEND Forum Section changed as well! New Image footer Day time Night time GFSquad.com's logo colors were also changed and inspired from GFriend's new concept logo 'Rainbow' New logo color for GFSquad Twitter cover Preview from twitter Thanks to GFSquad staff @GFSuzr (& @Buddies_art ) for the new theme! As GFSquad made a new theme for GFriend comeback, we are curious about your feedback ^^ What do you think of the new theme Buddies? You can comment below! Let's welcome "GFSigns" to our emoticon family! Created from scratch for GFS. Just thought I'd let you know. To select them, click on the emoticon button. Scroll down to "GFSigns" It's highly likely that more "GFSigns" will be added in the future, so keep checking back. GFSquad.com iOS App on Apple! 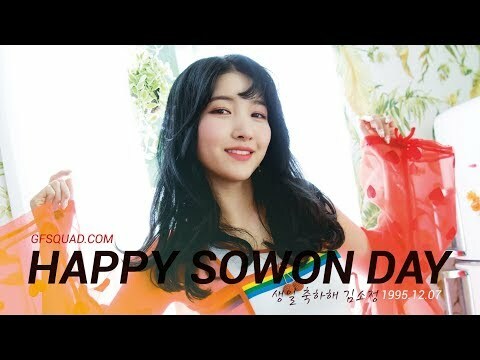 GFSquad.com 애플 스토어 앱! Just a short while after announcing the GFSquad.com app on Android, I'm excited to share with you all that GFSquad.com app is now on iOS too! YES YES YES! Great news for all you iOS mobile users! Download GFSquad.com App for iOS! For all of you iOS mobile users, hope you install it and have fun with our new app! Download GFSquad.com App for iOS!